Oprah Winfrey came by to talk to Kelly Ripa and Michael Strahan about the movie Selma, which I am excited to see, though Kelly had kept saying she was bringing all of her favorite things for the audience. People were freaking out. “She needs no introduction, she is everything, she is the center of the universe, she is my best friend no matter what Gayle King said, she is our favorite thing,” Kelly said. “It never gets old.” Oprah was in bed all week with the flu, so she didn’t touch people. She felt great now that she was on the show, though. Kelly said she was sitting between two of the most fascinating people on the planet. Kelly asked what the least fascinating thing about Oprah was. She is fantastic at stain removal and she loves it. Kelly said she was a stain master too. Oprah asked what her cure for a dog who had an accident was. She said the animal shelter. 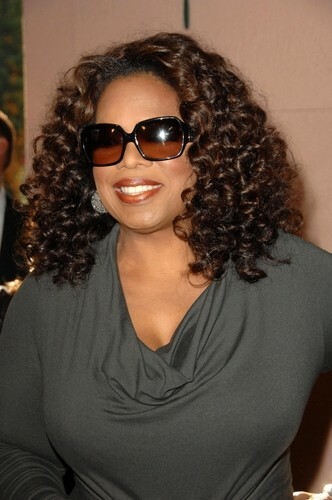 Oprah trained three dogs at the same time. Her carpet is a silk/wool blend. You need seltzer water. Clean it, then put the seltzer on it and let it bubble up. Will there be discoloration? You need to blot gently. With pee you don’t blot gently. Do it twice. Then you use Nature’s Miracle. Then blot gently. Oprah crossed something off her bucket list. She loves truffles. Lisa Marie Presley and Oprah are distantly related. She sent Oprah truffle salt and she became fascinated by truffles. She did a truffle hunt. You go out with dogs. Kelly went for Neil Patrick Harris and David Burtka’s wedding. The dogs only speak Italian though. Kelly went to Jimmy Kimmel’s house and he was making pizza. He asked if she wanted some of Oprah’s truffle. He took the lid off the box and light beams shot out and there was a giant truffle. He shaved it on the pizza. Every other pizza besides the Oprah pizza was left alone. Oprah spoke to the students at Stanford and the moment on her show that changed her life forever. She talked about the moment with the skinheads. A guy called her a monkey and in the middle of the show, she saw them signaling each other. She thought she was doing good, but they were using her. She said she’d never be used again and that she wouldn’t do it again. She had them on again later and they said she was right. They used it as a recruitment tool. Television is a platform and it’s energy going out. You have to be conscious of it. Oprah had an event called “The Legends That Paved The Way.” Oprah’s a student of the Civil Rights movement and knows people paved the way. 10 years ago, she held a Legends Ball to celebrate them and say thank you. When Selma came out, she thought about civil rights legends, so she had the legends event again with all those people who were on that bridge. Kelly said it’s one thing to hear about it in school, but to see it, you see how scared they were. You feel pretty safe when your march today, but they didn’t know if they’d survive. Selma is about Martin Luther King Jr. leading the Civil Rights Movement in Selma. They decided to go to Selma and make the charge for the right to vote. It was legal, but the way the registars would handle it, they would ask ridiculous questions and there were poll taxes. Oprah played Annie B. Cooper. She didn’t want to do it, because she didn’t want to hit more people in movies. But she read about Cooper on her 100th birthday and how she watched her show every day with a tuna fish sandwich. It would be a real honor for her if she played her. She was an ordinary person who worked in a nursing home, but she had the courage to demand the right to vote. She had the walk down pat, but Oprah did that scene the day that Maya Angelou died. She used it. She’s really transformative, and Oprah said it was a privilege to do it because she was a product of it. She was also excited to produce it. In the clip of Selma, Oprah’s character was trying to register to vote, but the registrar wouldn’t let her. He asked her all of these ridiculous questions. It happened over and over again to people. “I fear for that actor,” Kelly said. They also got four Golden Globe nominations and NAACP awards. They also talked about how amazing David Oyelowo was and how they did The Butler together. Oprah says her role is to help people fulfill people’s dreams. Selma will be in select theaters on December 25 2014 and nationwide on January 9 2015.